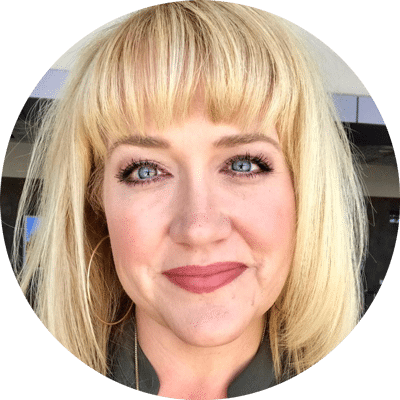 A few months ago, I noticed a few of my Facebook friends talking about how much they loved their Instant Pot. So when I spotted it on sale on Amazon Prime Day, I grabbed one and I am so happy I did! A pressure cooker has been on my list of must-try kitchen tools for a long time and the Instant Pot does not disappoint. 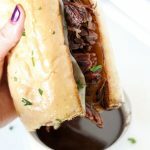 This Instant Pot French Dip Sandwich recipe is just one of our family favorite recipes that I have loved converting over to the Instant Pot. 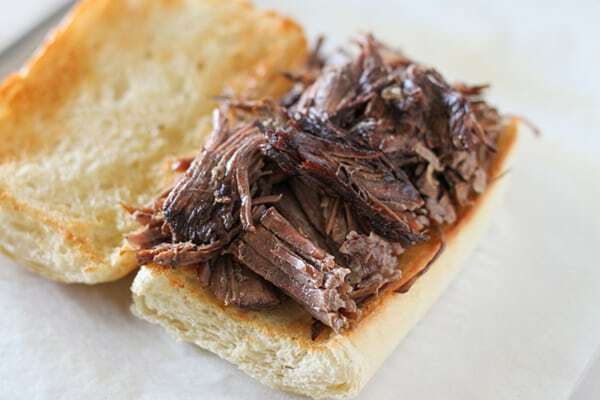 I have made this french dip sandwich recipe so many times in the slow cooker, but they need at least 8 hours on low plus searing time. Sometimes the mornings are just too busy to prep for the slow cooker. If you have the same problem, welcome to the Instant Pot! It’s truly a one-pot wonder. It’s a pressure cooker, which means you can have a fall apart tender pot roast in a fraction of the time of an oven or a slow cooker. 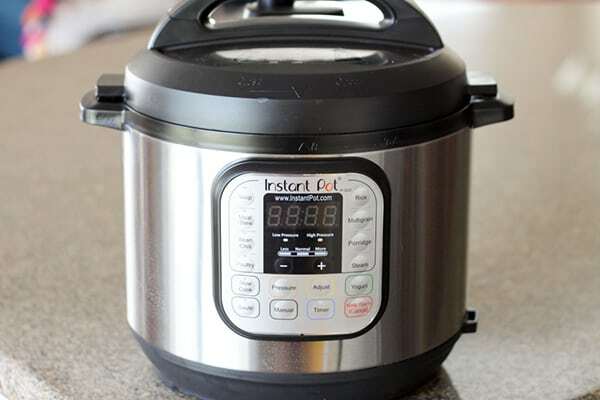 The Instant Pot also functions as a slow cooker, a steamer, a yogurt maker and a rice cooker. One of my favorite features in the sauté function, which allows me to sear my roast right in the Instant Pot. It’s an incredibly handy appliance to add to your kitchen and it’s developed a loyal following, just read the Amazon reviews! 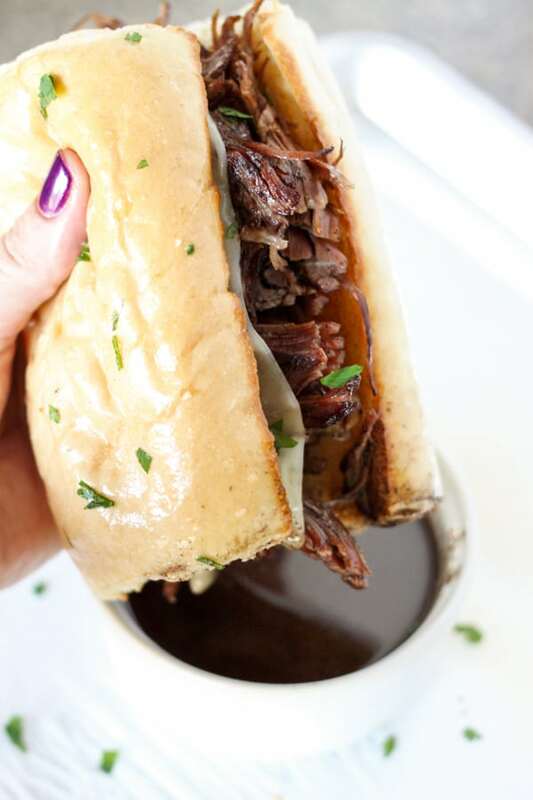 If you are new to the Instant Pot, or just looking for an easy and delicious recipe you can make in the Instant Pot, this French Dip Sandwich recipe is going to become a favorite! 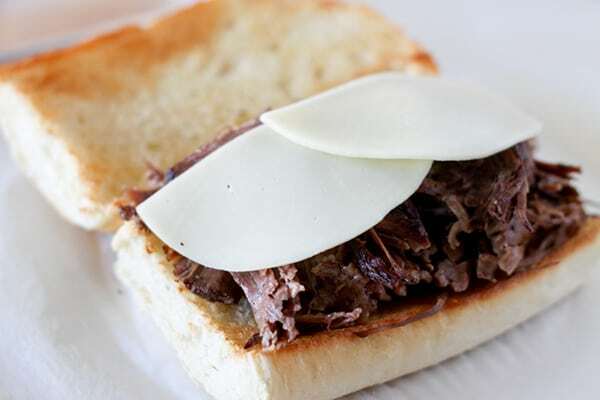 Tender chunks of beef roast with melty provolone cheese piled high on a toasted garlic bread roll. The best part is, these sandwiches taste like they took all day to cook, but only take about two hours in the Instant Pot and just a few minutes of hands-on cooking time. 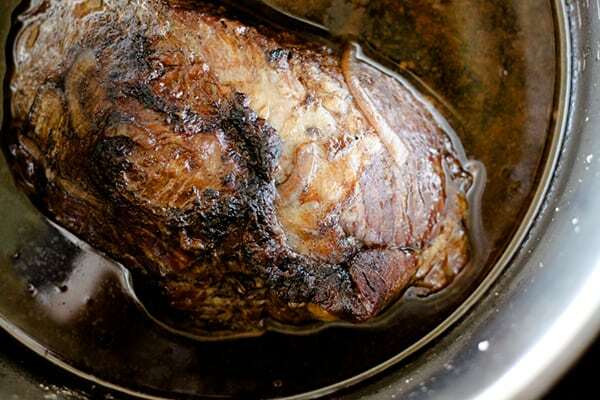 Yes, that’s right, a fork-tender roast in just a fraction of the time of a slow cooker. Start with a 2.5 pound chuck roast. For best results, let the meat rest at room temperature for at least 15 minutes before searing to let the chill come off. Season with salt, pepper and garlic powder on all sides. Add one tablespoon of vegetable oil to the Instant Pot and hit the sauté button. The pot will be hot enough to sear the meat in a few minutes. Using a pair on long heat-proof kitchen tongs, sear the roast on all sides. 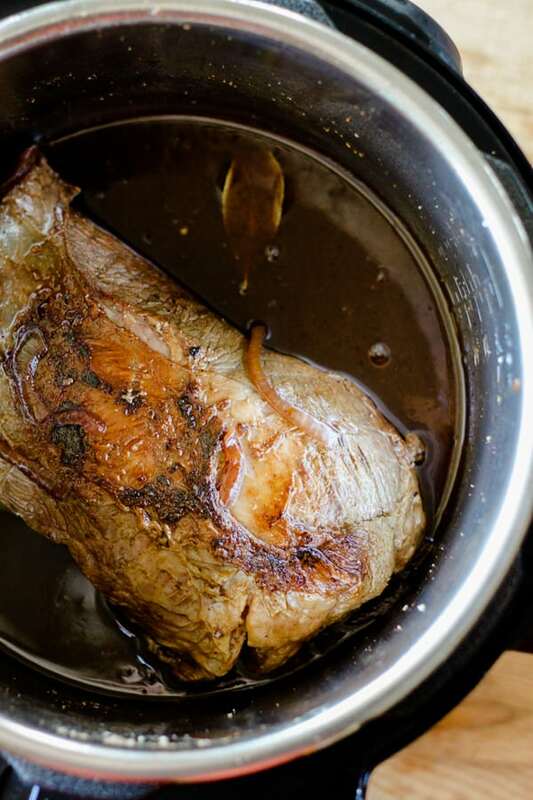 Remove seared roast from the Instant Pot and set aside to be added back in in a few minutes. 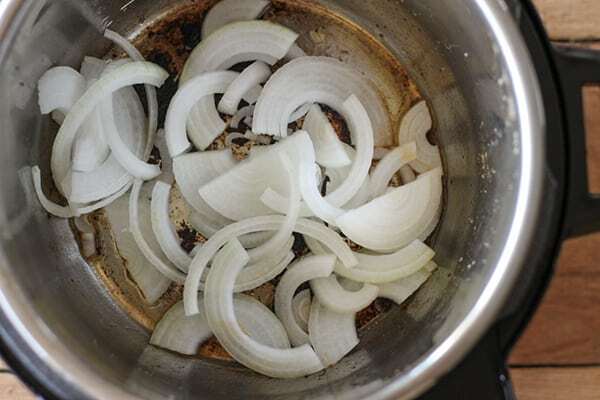 Add onions to the pot and sauté, just until they start to soften. Add 1/2 cup of red wine to the pot and let it simmer until reduced by half. The pot is very hot, so reduction won’t take long. Enjoy the wonderful smell of the wine and onions simmering away! 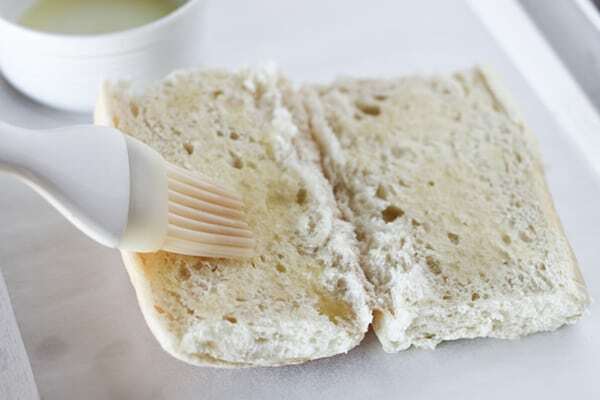 Use a wooden spoon to scrape up seared bits from the bottom of the pot as it simmers. Once wine has reduced, add in low-sodium beef broth and bay leaf . 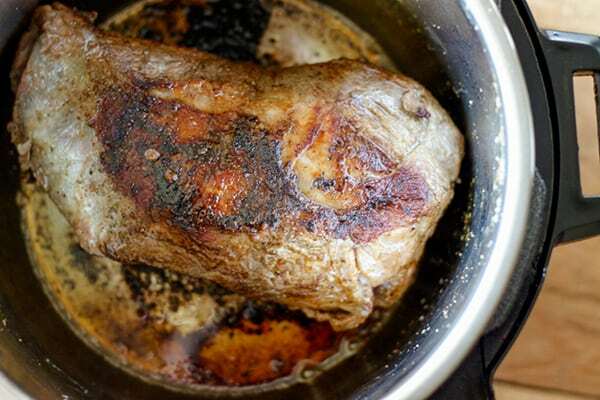 Return the chuck roast to the Instant Pot, lock the lid in place and make sure the pressure release valve is set to Sealing. Hit Meat/Stew function and increase cooking time to 100 minutes. Now step away from the Instant Pot and let it work it’s magic. It will take a few minutes to come up to pressure, then you will see the display switch to the 100 minute countdown. 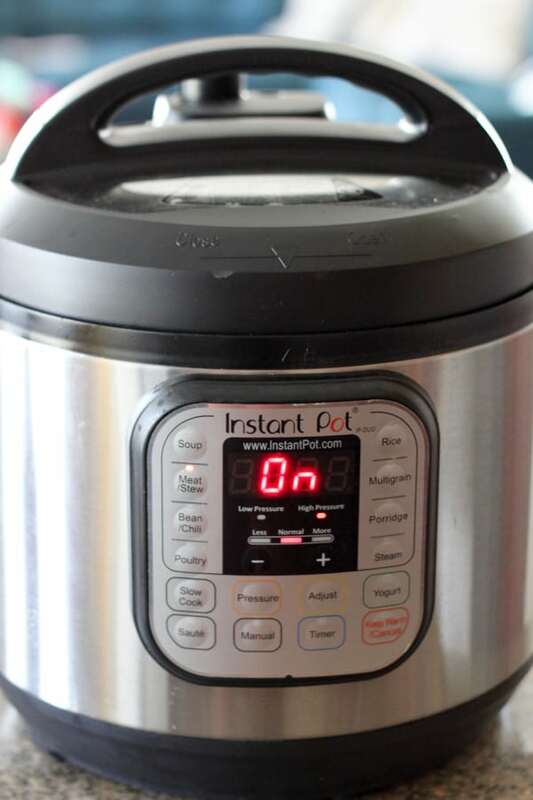 Once the countdown is complete, the Instant Pot will automatically switch over to the Keep Warm/Cancel function. Do not attempt to open the Instant Pot at this point. The pressure is still built up inside the pot. Let the pressure naturally release for 25 minutes. This also allows the meat to rest in the Instant Pot. 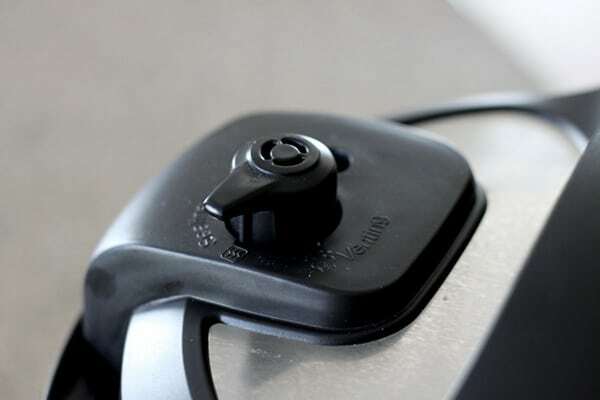 Before opening the Instant Pot, turn the pressure release valve to venting to release any left over pressure, then remove the lid keeping it angled away from you. Here you have it, a lovely fork tender roast, ready to be made into French Dips. Remove the roast from the Instant Pot and strain au jus through a fine mesh strainer. Reserve au jus for dipping. For an extra layer of flavor, we are going to brush and toast the rolls with butter and garlic powder. French Dips served on garlic bread? Yes, please! Pile the meat on the garlic bread rolls. As you can see, it’s incredibly tender! Then top with provolone cheese slices and let melt under broiler. Sprinkle the sandwich with freshly chopped flat-leaf parsley for garnish and serve with hot au jus for dipping. Heaven! Season chuck roast with 2 teaspoon of kosher salt, freshly ground pepper to taste and 1/2 teaspoon of garlic powder on all side. It looks great and I need more good recipes for my instant pot! I have a question though. I don’t keep Red Wine around and usually just use better than bouillon beef broth when it calls for it. Would I still need to reduce the beef broth like I would the wine or just start with less? Thank you! Thank so much, Angela. I would recommend leaving the wine out and just skipping that step. Thanks for the question! Hi! 100 minutes seems really long for chuck in the Instant Pot. Similar recipes seem to call for much shorter times, for example 55 minutes for This Old Gal’s French dip. How did you select 100 minutes, and have you experimented with other times? Thanks. Thank you for the question! Yes, it is long compared to other recipes. I have made a chuck roast in the instant pot six times now and have been continually disappointed that the meat wasn’t fork tender. Each time, I increased the cooking time a little until I got the results I wanted. You can certainly get a cooked roast with a shorter cooking time, but I was going for fall apart fork tender. I hope this helps! I’d love to hear your experience! I made it last night with better than boullion instead of wine and it was great! I used the leftover juice with some more water and better than bouillon and veggies to make make beef stew with the leftovers. HI! I made the French dip last weekend and my son and husband went nuts!! Loved it!! I made it again tonight and my son (15) told me we should have French dip Fridays from now on. Lol! Tonight I did everything exactly like last weekend, but the meat wasn’t as tender and easy to shred. The cut of chuck roast looked leaner than the previous attempt. The first one had been pretty fatty so I went with leaner this time. Could that have made the difference? I even gave it an extra 15 minutes and 15 minutes NR and it still seemed dry and not wanting to shred as easily. Would love your thoughts. So glad to have found this recipe!!! I’m so glad they liked them! Yes, the amount of fat could have been the difference. You may also find a difference in the grades of meat, select vs choice. You could add a little more oil or even butter (not the healthiest, but I’m sure delicious! lol) if you think your next cut is on the lean side. Made this for dinner tonight just as written. It was a big hit with all of us! Super tasty, plus I got the three pounds of beef I used for only $8. Will definitely make it again. That’s great, Amy! Thank you! OMG got an InstaPot for Christmas and broke it in tonight with this recipe. AMAZING!! Thank you so much. I never leave comments on recipes, but this was one of the best meals I have ever prepared. 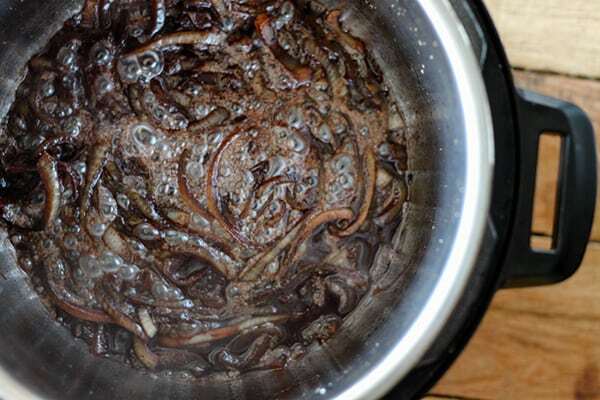 We didn’t have red wine on hand, so substituted balsalmic vinegar, and it was AMAZING!! Even my MIL was impressed. And my 4-year old asked me to “please please please make this very often!!”. 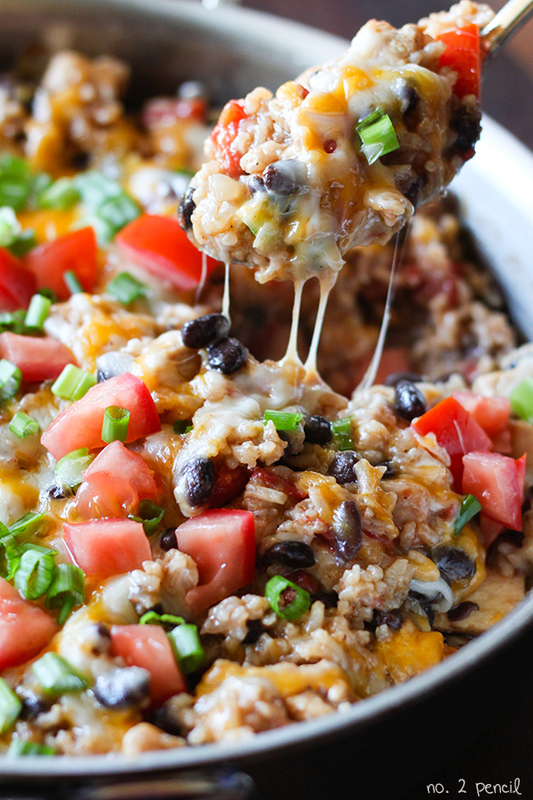 Do yourself a favor and make this for your family tonight!! I don’t have red wine….I do have balsamic though. Would I use the same amount? Balsamic vinegar? I would just try a splash. 1. Make sure Instant Pot is closed and valve is set to sealing. 2. Then hit manual button, it should automatically default to high pressure. 3. Then increase time to 100 minutes. If you use the stew/meat button that will simply be a preset and will save the cooking time you set if you make the same recipe next time. I really only use the presets for rice since I make so many variations, so depending on what your habits are! Hope this helps! I made this following the recipe exactly. My family inhaled this dish. It was out of this world!! Thank you!!! I will sound like a broken record, but I just tried this tonight and my family LOVED it! It was so easy, smelled amazing and tasted delicious. This will go in my bookmarks! Thank you so much! This was the first recipe I made in my new Instant pot! It wsas so delicious and will be a staple in our home! Thank you! 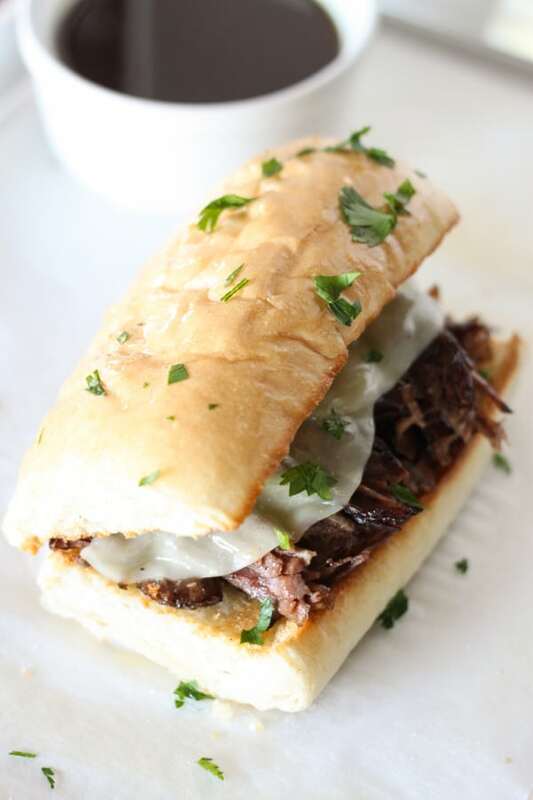 Just made this French dip sandwich and it is delicious! Restaurant quality! Substituted bottom round roast (that’s all that was available at the market) and onion soup mix for the actual onions. Will definitely be making this again soon. Thanks for posting. The instructions were spot on for us users new to the instant pot! Just had to pop over and say this turned out delicious! I made it last night with a 5lb roast, cut in half. I didn’t change anything in the directions. With my Instant Pot, the meat timer doesn’t go up to 100 minutes, so I used the pressure cook (high) button instead and adjusted until the readout showed 1:40. Cooked to PERFECTION! Thanks for the recipe! I’m sorry. I haven’t tried cooking from frozen, so I can’t say for sure. I hope it works out ok for you! I decided to just try it frozen and it turned out so perfect! It shredded by just touching it! Super tender and amazingly delicious! I still seasoned and seared it on all sides, but in a separate cast iron pan. Once that was all done I cut the roast (which was 4lbs) into 4 pieces and seared the newly exposed meat. I did the onions in the IP with balsamic vinegar because I didn’t have the wine. When that was reduced, I put the meat in with the onions. I put the beef broth ( A little more than 2 cups) in my cast iron to get all the meat bits out and then dumped it all in the IP. Added the bay leaf and set it to 100 minutes. I let it NPR for 25 and WOW! Perfect! That sounds great! Thanks for the update! This was such a huge hit for my family I am making it again. I have a mother-in-law, a teen, a tween, a partner and there in rarely consensus. We wanted more meat in each sandwich last time, so I am trying 3lbs. I am not big on cooking, especially after a long work day, but the IP has changed my life. Your recipe is so clear and easy to follow. A perfect recipe for an IP newbie wanting to try something that will get huge smiles and full tummies. That’s awesome! Thank you for rating the recipe and taking the time to leave a comment! Solid recipe! My boyfriend absolutely loved it and wants to steal it for himself. Like you, I’ve tried making roasts and other meats in the IP a couple times before this and didn’t get the results I wanted because the cooking time was too short. 100 minutes was just right so I’ll have to remember that for future recipes! I did think the au jus was a little bland for me. I might try a bit less broth or some additional seasonings next time but it was still delicious! Not to be redundant, I have read all the comments. So do you mean 1 hour and 40 minutes? Because 100 on the instant pot is 60 minutes (or 1 hour). So 100 minutes by that we are to set it at 1:40? Thanks. Sorry, I finally watched your video. question answered. Thanks. I usually don’t leave comments on recipes but this one is just so amazing that I had to. The roast became so tender that it was coming out of the instant pot in pieces. The only thing I did differently was use grape juice instead of wine. It’s just what I had on hand. Still turned out great! Plus my husband loved them! Will most definitely make these again. Thank you! Hi! I made this once already and it was amazing! I bought two 2.5 lb Chuck roasts this time because I have friends coming over. Do I add more broth since there is more meat? Thanks! Yes, you’ll want more au jus for dipping. Are you using an 8 quart IP? Made this for a casual dinner for company. Everyone one loved it! Thanks for providing such detailed instructions as I am new to the Instant Pot and your instructions make it very easy to follow. I made this for the second time tonight. It turned out delicious both times. It only took 45 minutes with quick release for me. Truly awesome recipe. The only problem I have is tonight I strained the liquid to dip our sandwiches in and it is super greasy. Not appetizing at all. Not sure what happened. The meat I used was marbled but not heavily. . I received my Instant Pot for Christmas and used it for the first time last night and made these. Huge hit in the house. My mother-in-law even said it’s the best meal she’s had in a long time. This will become a go-to dish in our house now. Give it a try and you will not be disappointed! This is my favorite instant pot recipe I’ve found in the two years I’ve had it. It’s been a part of my rotation for about half that time now. It’s perfect exactly as written, which is something I seldomly say. Sidenote, today I used white wine since I didn’t have red on hand and it was still wonderfully delicious, (though of course red is better) . OMG…I made this for the Super Bowl last Sunday. I also made a pot of chili, which was hardly touched! Everyone just wanted another sandwich! Even my picky eater son had seconds. It was so delicious! Will definitely be making again. Thank you for a recipe that my whole family loved! Best thing I have made in my IP. So yummy, I want to make it again! And definitely better with the butter garlic bread then plain rolls.